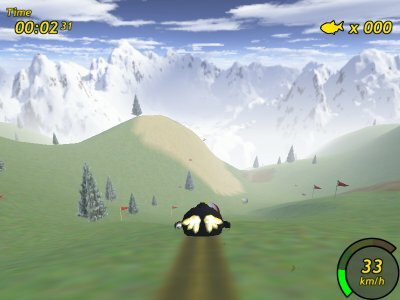 Having played the game Tux Racer after getting 3D hardware acceleration working under Linux, I had a look at the data directory and it looked like it would be fairly straightforward to change the textures. I decided to create a grassy, summery theme, so replaced the snow with grass, ice with mud and rock with sand. Herrings have been replaced by beach balls, for some unexplained reason. Tux now leaves a trail of dirt (he's so heavy that he tears up the grass), and throws up dirt rather than snow particles. This had the interesting side-effect of also changing the snow on the start screen to dirt, which looks rather strange because I haven't changed the other images for the start screen. I haven't yet replaced the background images, so there are still snowy mountains in the distance. The beach ball image was rendered with POV-Ray, all other images were created with the GIMP. I should probably draw new trees sometime.